This journey was planned almost a month ago – I was to get three continuous days off for the first time after I joined my new job, and I decided to make utmost use of it. To add the icing on my cake, a family function was decided to coincide with my ‘vacation’ as well. Tickets for both the directions were booked through my friend. The tickets were booked both ways by Shama Transports buses. Eventually, I had to cancel my return ticket since some members from our extended family were returning by car, and I was invited to join them. Fast forward by about two weeks – It was a Sunday, and I was roaming around Madiwala post noon. My friend had joined me, and we were talking about almost everything under the sky. During the course, I met a few people from Kallada G4 – they knew me through this blog and recognised me as soon I said my name (that was really an award for me). What followed was something undreamt of. On the day of my journey, Kallada G4 were taking delivery of a pair of new buses. I was invited for the pooja ceremony – and later joined the management in sending off the buses on its first trip as well. It was drizzling outside my home – left with no option to wait, I decided to start hunting for an auto. It was more windy than rainy – it was wetting my pants. I got an auto about 5 minutes into my walk, and the driver agreed to drop me at Madiwala for Rs. 10 more than the meter fare – getting a driver to switch on the meter is no less than winning a medal in this part of Bangalore, this was akin to winning a lifetime achievement award! It was all fine till we crossed Bommanahalli – we then entered into one of the worst traffic blocks I’ve seen in recent times – thankfully, the driver managed to dodge through fairly well. But he was worried about his income – he had agreed to run on meter charge, and this block would drain a lot of money for him. He dropped me at Madiwala at around 2010hrs – as I got off, I rounded off the fare and paid him Rs. 100. He certainly was delighted. The new babes of Kallada G4 were being prepped up for departure now – the management was present at the Friend’s Travels office. Pleasantries were exchanged, and I decided to hang around till the bus was sent off. The management were really serious about the passengers and their requirements – suggestions were taken positively, and some earlier suggestions were implemented as well. I really admired the way the brothers took passenger feedback – this will surely take them to heights in the coming days. Passengers’ satisfaction is one thing which money can’t buy – only consistent quality of service would take them to that level. The passengers travelling by the new bus were treated with sweets and some packed fruit juice. A lucky draw was held and two lucky winners were given some gifts as well. 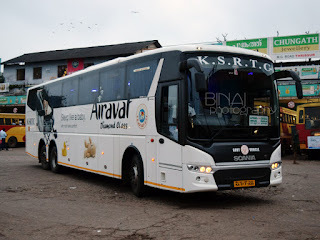 The first bus was sent to Trivandrum (as regular service) and the second to Ernakulam (as a special service) – I badly missed travelling in a brand new bus. Both the buses had really experienced crew. I bid bye to the people from Kallada G4, and headed towards the Shama office to get my boarding pass. The ever smiling Manoj at Shama’s office greeted me there – pleasantries were exchanged and he handed over the boarding pass to me. My seat number was changed, but it still was a window seat. I was moved from Seat #A to Seat #H – no complaints, since I was a bit iffy about travelling in the first row. I headed out for dinner – did not have time to find out a hotel, and hence decided to eat from the new mobile restaurant right outside Shama’s office. The food was really tasty – they do really good business as well. I headed back to their office at 2135hrs, and had some light chat with Manoj. I rechecked with Manoj, and confirmed that the bus would drop me inside Thrissur town, and that I would not have to wage an ugly fight with the crew like last time. The ever smiling Manoj reassured me. The bus.. KA-01-AA-17. This is an old image. But it is the same driver.. In the mean time, the bus pulled in – KA-01-AA-17, with about 5 lakh kms on the Odo was parked right outside Shama office, and not in the petrol pump as is the norm off-late. The pump was slushy and dirty – parking it on the road was surely a better option. Boarding was very quick – luggage loading also was handled quickly. Farooq from Shama’s office was the checker – he quickly counted the number of passengers and Okayed the departure. We had 49 seats and one cabin – making the total passengers 50. One off-duty driver of Shama too got in, and one more random guy got in. The driver for the trip was Mr. Sebastian – a regular crew of Shama. The bus got moving at 2140hrs – around 5 minutes ahead of schedule! The Ayyappa temple underpass was chocked, and Sebastian took the bus through Madiwala market instead. The bus was showing its signs of aging – it’s been running for the past 3 years or so. The pickup was awesome – the bus was out of a service that day, it seems. Sebastian was initially very vocal with the cleaner – but the volume decreased as the journey progressed. My co-passenger seemed to be a regular in the bus – he knew the driver well. But this guy (the co-passenger) was behaving as if he owned the bus. The bus took the elevated highway, and flew past the traffic below. 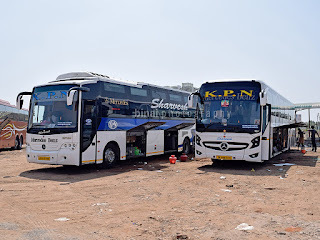 On the way, I noticed that the KPN office in Bommanahalli resembled a government bus station with passengers taking up every inch of space there. The Electronic City toll gate wasn’t as chaotic as I expected it to be, but the Attibele toll gate lived up to its (dis)repute. 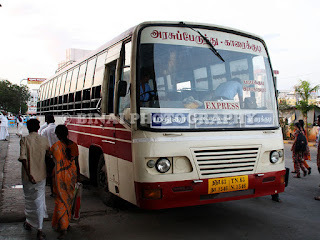 The traffic block was even worse at Hosur incoming Checkpost, since the people there decided to check every incoming commercial vehicle – being Friday, a lot of special buses were being operated, and they were sure that at least a couple would be running without permits! The result – a massive traffic jam. Our bus was stopped and the crew were asked to produce the documents. Our documents were in perfect order, and hence we did not lose time. I slept off soon after the bus crossed Hosur. I woke up sometime in the middle of the night, when my ill-behaved co-passenger pushed my hand off the armrest. It seems he had ‘purchased’ the arm-rest while booking the ticket – he spent Rs. 1000 and the bus belongs to him, it seems! I requested him to let me use the arm-rest. His answer was, “Don’t you see me using the armrest? Don’t behave like a child”. Ohh! Did I ask him to give his property for free to me? I did not have the patience or time to argue with such people, who think they own the entire bus just because they paid for the ticket. I found another better position to sleep, and continued my forty winks. I woke up sometime (may be around 3~4 AM) later when the bus stopped for a break. His Highness my co-passenger might not take it lightly if I disturb him to make way for me – so I decided to please goddess sleep. I fell asleep very quickly again. This was one deep slumber because I did not even realised what route my bus took – whether it went through Walayar or did it take the alternative route via Velanthavalam! I woke up again at 0605hrs, when the bus stopped to drop someone – the groggy eyed me read the place name as Ottapalam. I was in a state of shock – we were still at Ottapalam? I decided to continue my sleep since we still had a long way ahead... but wait; the bus took a right turn. Oh! Which is this turn? The road here was bad – really bad. The bus swayed all the time as it moved forward. I realised now that we were at Wadakkanchery and not Ottapalam! The board I read earlier was “Ottupara”, which my sleepy eyes interpreted as “Ottapalam”! I was now relieved – we were surely late, but not very far from my destination. It was raining fairly heavily outside, as I understood. I slept for some more time, and woke up at around 0620hrs. My co-passenger was still the owner of the bus – I did witness some trouble he created for the poor lady passenger on the seat ahead of him. This time, his highness did not like the lady reclining her seat. The reason: his highness was not able to keep his legs upright! This was the height of things – he deserved to be kicked out of the bus for such behaviour. It was anyways not my business – the lady did not protest, and instead kept the seat upright! In the mean time, we rushed past North Bus stand in Thrissur. The driver asked the cleaner to wake up Thrissur bound passengers now. Lights were not switched on. I most humbly and politely requested his highness to make way for me, so that I could get off his bus. Of late, I carry almost negligible baggage – except for my backpack. I picked up my bag from the luggage rack, and made my way to the cabin – I was still groggy as I struggled to hold myself up in the cabin. The bus slowly ran past Round, and stopped outside the District Hospital, at 0628hrs. I wanted to thank Mr. Sebastian for his safe driving – he did not have the itch to overspeed even though the bus was late. He drove very carefully through the wet, slippery roads on the Palakkad-Ponnani state highway. He did honk a lot – even during the night, but his overall style of driving deserves applause. As I got off my bus, I saw the Viji-Yathra B9R to Pathanapuram sneaking out of Thrissur. Fresh from my previous experience of denial by auto guys at the rickshaw stand, I decided to walk a little bit ahead and flag down an auto – but a god sent driver near the stand (not in the stand, but on the road) agreed to ferry me to the Sakthan Bus Station. Remarks: The bus, with over 5lakh kms on the odo, did show its age. It made a lot of noise from the rear suspension set-up – a problem fairly common with buses of this age. The interiors were otherwise very clean. The bus appeared fairly fresh inside – the seats were clean, and the blankets provided were of proper size. This bus (and its pair, KA-01-AA-13) have a good angle of recline for its seats – it somewhat hits the knees, but the seat is fairly comfortable to sleep on. The crew behaviour was good – the driver instructed the cleaner only to wake up the passenger who were alighting (he was reading out the seat numbers). The driving was excellent – no sharp cuts, rash driving or overspeeding in the rains. He was very cautious. He deserves applause – such drivers would surely entice safety lovers. The co-passenger I had was irritating to the core – such people should not be allowed to travel on peak days, or put them in some isolated seat, or even better charge them for two seats (or four seats, since the passengers ahead of them should not be disturbed). Such people should never be tolerated – they spoil the fun of travel of everyone around them. That fellow surely left a bad taste in my mouth, and even for the lady sitting ahead of him. Will I take this service again? Shama is a mixed bag – I’ve had good and bad experiences from them. They service is no-nonsense, but lacks consistency. They have really good drivers, who are consistent with their style. I would not hesitate taking this service, but would doubly ensure that they would adhere to the promises they make while booking. As of now, it is surely a good option. Seems a different narration from other travelogues. 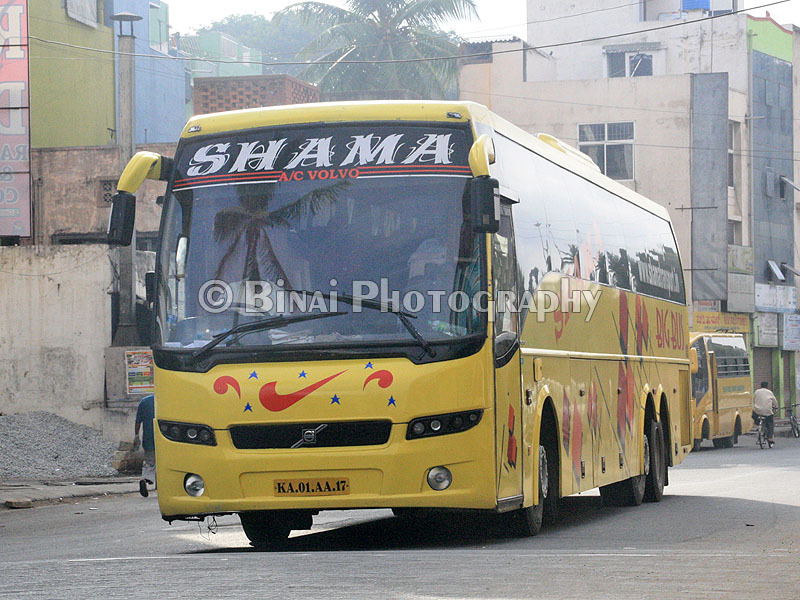 Well, I traveled by the brand new Kallada G4 bus from BNG to EKM yesterday.The bus was KA 01 AB 5738(Yellow Line). Travel was good, the bus had only about 5900 Kms in the odo before starting from Madiwala. Left at 20.40 and arrived about an hour late(06.40)-10hrs. Engine was sounding little badly. And most funniest thing was that two bed sheets in the bus were stolen right on the first trip(they didn't replace new)! Wasted a lot of time at Palakkad due to wrong way. The bus had to reverse about a Kilometer due to this. Crew were well behaved.